Season 7 of Doctor Who is easily one of my most favorites of the entire run of the series. There is a very fresh feel to the series with the new Doctor being exiled to Earth and partnering with the military organization UNIT. 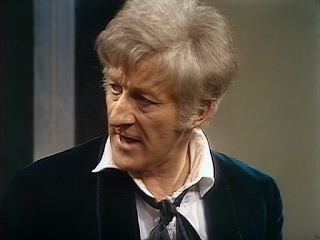 I don’t know about anyone else but I do watch Doctor Who in order continuously and when I get to the Pertwee episodes starting with Season 7, it actually takes some time to get used to it because the series is vastly different from what we have seen up to that point. No longer is the Doctor exploring space but can almost be confused as a civil servant working for Her Majesty’s government. Obviously that description is a little overboard but things for the series changed substantially. Purchasing these titles from the links above directly helps my site! Inferno is the final story of Season 7 comprising of seven episodes. Season 7 itself is quite short only making up 25 episodes. This was the shortest season to date. The William Hartnell and Patrick Troughton episodes took up most of the year with new episodes so this was substantially shorter. Because the Doctor was exiled to Earth, it obviously meant that he couldn’t travel in the TARDIS so the season’s monsters were either from outer space or home grown but the action was based on Earth. Inferno is the name of a government project that has a team of scientists drilling to the Earth’s crust. There is a special kind of gas, Stahlman’s Gas, which will provide endless amounts of energy. Stahlman’s Gas is named after the man who discovered it Professor Stahlman who is also heading up the project. UNIT is on hand to handle the security arrangements but trouble crops up almost immediately. There is a murder. Immediately the Brigadier investigates to see what happened but little could he imagine that the murderer is a well-liked repairman who is turning into a monster after touching a strange green substance emitting from one of the drill pipes. The Doctor is at Project Inferno because he has a different agenda for being there. Not so much to help on the project but more to cypher power from the project to help get the TARDIS back up and running. 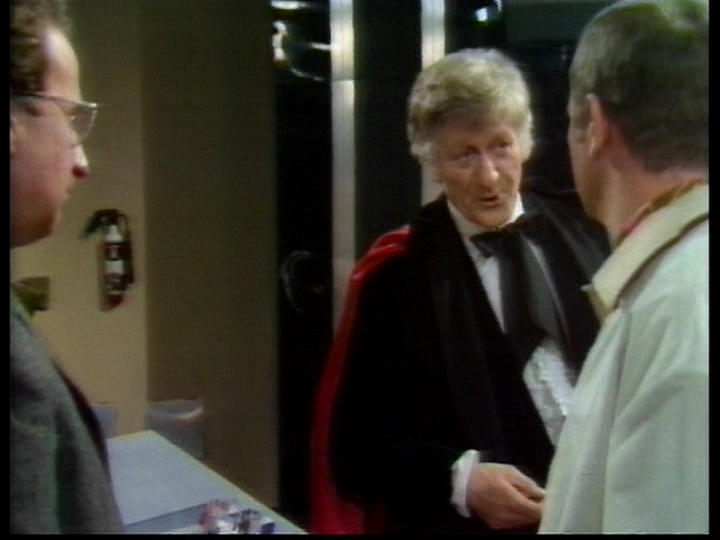 Since the events of The War Games where the Doctor was exiled to Earth, he has been trying to get the TARDIS working again. He believes that the power from this project can help him. One of Stahlman’s biggest problems is not the drilling (even though everyone tries to tell him it is a problem) but the Doctor. 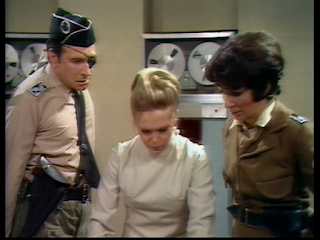 The Doctor and Stahlman dislike each other to the point that Stahlman orders his scientists to make sure the extra power going to the Doctor’s hut to be turned off. This is done at a crucial moment for the Doctor as he is navigating the TARDIS. This leads to disastrous results for the Doctor. With the power being turned off, this slips the TARDIS to an alternate universe with a couple of very prominent changes from his universe. The drilling on the alternate Project Inferno is further along but the make-up of the government is vastly different. It is a very Orwellian dictatorship. UNIT is not UNIT but the British Republican Security Forces. 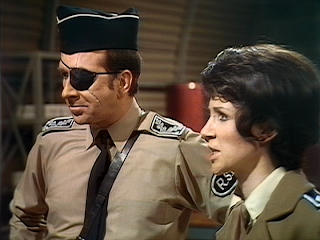 The Brigadier is the Brigade Leader (with an eye-patch) and Lis Shaw is Section Leader Elizabeth Shaw. 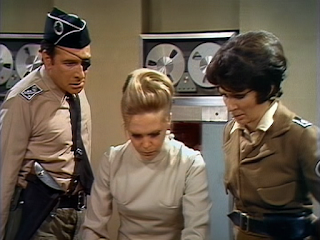 The Doctor is now an intruder and is treated as a spy. Meanwhile, the people who have been affected by the mysterious green substance are changing into monsters with Stahlman affected too. One of the great shames of British television released in the US is the fact that the Quatermass Trilogy has never been released over here. Released in the UK in 2005 this set gives us 3 landmark BBC television series from the 1950s: The Quatermass Experiment (only episodes 1 & 2), Quatermass II, and Quatermass and the Pit. 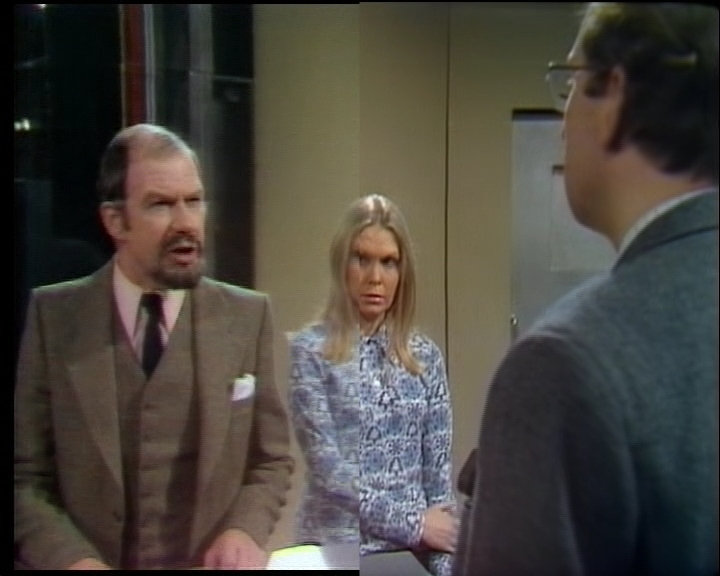 This is noteworthy as a good deal of Season 7 of Doctor Who was influenced by the Quatermass serials written by Nigel Kneale. 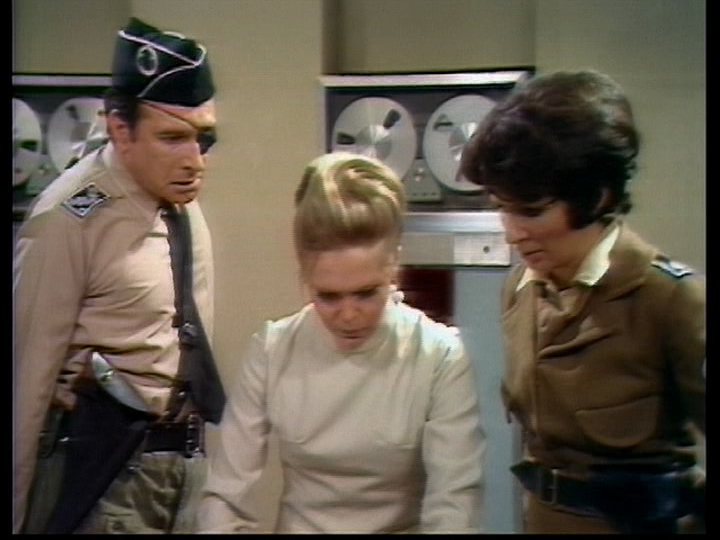 This story has some strong connections with The Quatermass Experiment and Quatermass II. The idea of a man transforming into something else isn’t Nigel Kneale’s creation but I feel this is an influence with people turning into Primords in Inferno and the idea of the green substance being deadly just like the sludge substance in Quatermass II. Any time a refinery is used as a location immediately recalls Quatermass II and gives the series a gritty look. Those serials really are worth seeking out. Inferno does have a gritty look to it but it also is incredibly bleak. The alternate universe becomes very bleak as the drilling gets closer and closer to penetrating the Earth’s crust. As the drilling reaches the crust, everything goes crazy. The Earth heats up and a really nice touch to accentuate it is when we see exterior scenes, there is a bleak red intense filter that gives the sense of sweltering heat. The look of the Primords is quite good with a great example of using make-up and wigs to create an effect rather than put a rubber mask on them. It retains the actor’s features rather than hiding them. One thing I notice as the story continues is how the sound of the drilling permeates throughout every scene. The low hum becomes louder and louder which makes the situation in the alternate universe feel more impossible to get out of for not only the characters but for the Doctor too. There are 3 chilling aspects to this story: the British Republican Security Forces, The Primords, and the cataclysmic results of the drilling. 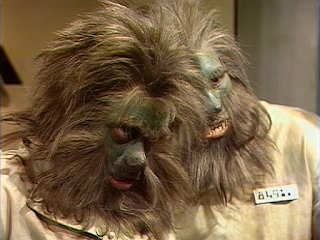 It is truly an impossible situation for the Doctor as more and more people are turning into Primords. I think one of the most frightening scenes in almost all of Doctor Who comes in Episode 4 as we leave “our universe” and we go back to the alternate universe where the Doctor is trapped. He is asleep in a cell but wakes up to the sound of something in the cell next to him breathing heavier and getting more irate. 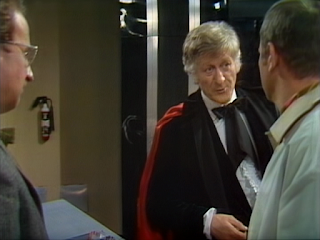 The Doctor yells to a guard to come in and help. 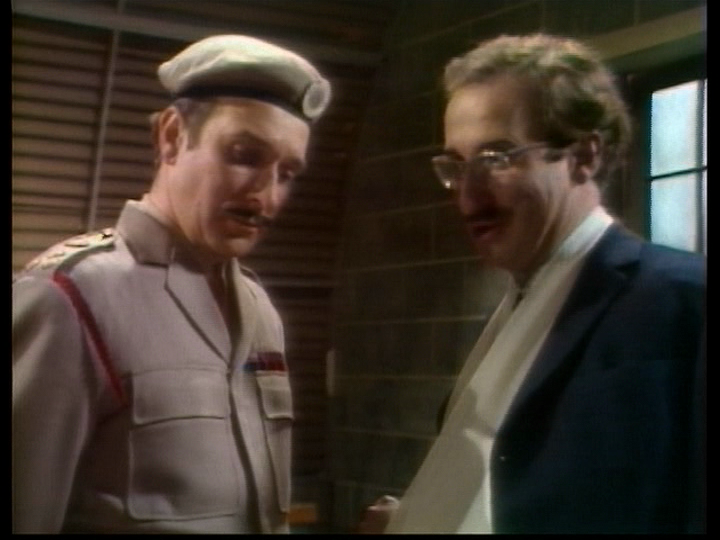 As the guard enters the cell next to the Doctor’s , the thing under the cover becomes more intense. 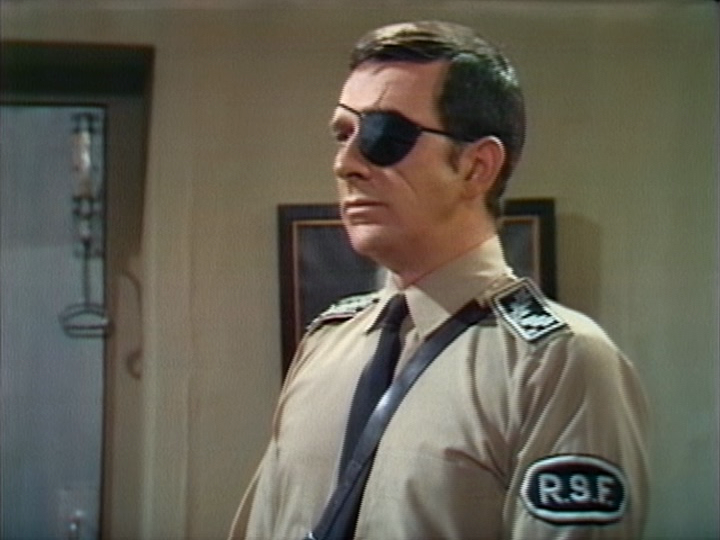 It is Bromley played by the brilliant Ian Fairbairn who gets up, picks up the guard and slams him on the bed. 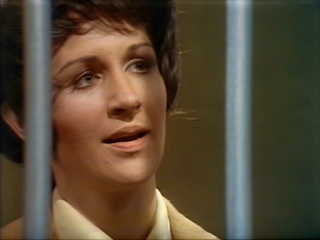 Then it becomes truly frightening as Bromley turns to see the Doctor in the cell next to him, bends the bars with no problem and enters the cell gazing at the Doctor the entire time. The Doctor is completely trapped. It is a truly wonderful and frightening scene. One of the most disappointing moments in the history of the Internet was when the Doctor Who Restoration Team forum and Web Site came to an end. Now, technically the site is still there but the articles are not really being written anymore. Now before someone chimes in to “educate” me, I know why this site isn’t being updated. I also know that the level of detail put to the original articles was extremely time-consuming. It doesn’t mean that I don’t miss it. It is invaluable to me for research and just general knowledge. I also know, from reading the old forum on a daily basis, that it must have been very tiring for the people involved restoring these episodes and answering questions or criticisms of all kinds. I am sure the criticisms were tiring but also just general questions must have been a time strain. Most questions about restoration, to be answered properly, could not be answered with a yes or no but with some level of detail. Add to that many do not understand the jargon, it needed to be “dumbed down” to be easy to understand. With every new article came all sorts of questions…..and debates. In the end, everyone loses but at least I am grateful for what we got. The last article added was the restoration for the Special Edition of The Claws of Axos which is actually very helpful for this review. The actual quality of Inferno historically has never looked great. 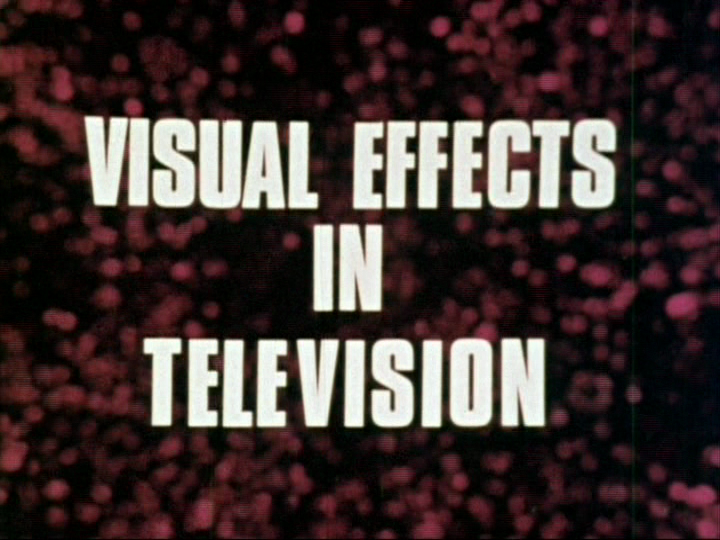 Even when I watched it on PBS in the 1980s, it looked really shakey video-wise. The video never looked particularly strong and was always a disappointment. When it came out on VHS it still looked pretty bad. The only existing color copy had originated from an NTSC 2” video dub converted to PAL. If you bought the NTSC VHS release from CBS/FOX you would have bought a tape (actually double tape) that was from an NTSC 2” video dub, converted to PAL and then converted back to NTSC for VHS. When it came out on DVD, there was a new technology devised that would help bring the fluidity back to those NTSC dubs to create something closer to PAL. That was called Reverse Standard Conversion (RSC). It was exciting because it meant that we could possibly see a really nice looking version of Inferno. Sadly we did not get that. Please don’t get me wrong, I was happy to see it tried and I think RSC has been successful. 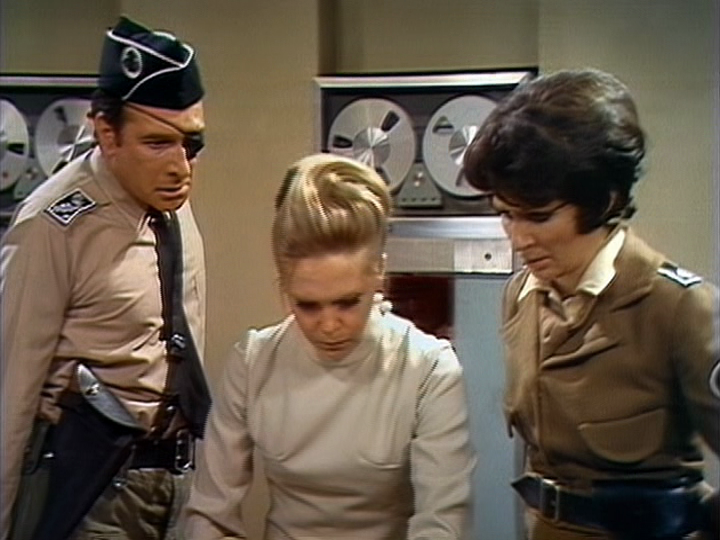 I thought the original The Claws of Axos was good and I think The Time Monster was a triumph. I have wondered if the quality of the finished results to RSC depended on how many generations down the master was that they used for the process. 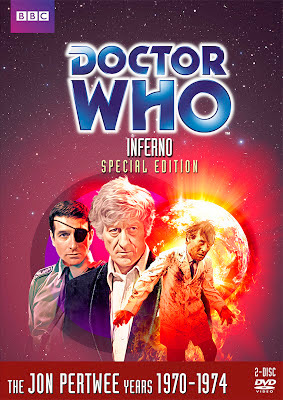 Were all NTSC dubs of Inferno the same generation as The Time Monster? I would think that one generation off could be an issue but I am no expert. It is a hypothesis. Finally, with this DVD release of Inferno I see a beautiful picture. Sometimes I can’t believe I am even watching it. The fact that The Claws of Axos was the last article added to the Restoration Team page is significant because I believe that generally speaking the restoration used on The Claws of Axos is much the same used on Inferno. I know at least one member of the Restoration Team occasionally checks out these articles. If what I am saying is completely off, let me know and I will update the article. Inferno originally was restored using only the 2” NTSC tapes given the RSC process. This restoration would have gone back to the 16mm negative film prints and an HD scan would have been made. Just like the work done on The Mind of Evil, chroma dot recovery would have been applied. Not using the color itself but the colour subcarrier information can be used to generate a map of the geometric distortions present in the recording and identify which parts of the image are chroma and which are luminance. The film prints were cleaned by Peter Crocker and the chroma was overlaid from the RSC master as would have been done from the earliest color Pertwee releases. Of course back then, that chroma was not from an RSC master but domestic off-air recordings. Some of these descriptions are taken word for word from The Claws of Axos article written by Steve Roberts in August of 2012. If you are someone who does not like the idea of Special Editions, I can understand the hesitation but these have been really worthwhile. Below I will expand on all the extras that are included on this set but for me it always comes down to the episodes themselves. I want these things to look the best they possibly can. I have a keen interest in restoration and to see something like Inferno come to life like this means a lot to me. You can put as many documentaries you want on these discs but to me, it is all about the episodes. Inferno looks the best I have ever seen it. It actually looks like 2” video. There isn’t a weird staticy pattern over the video. The picture isn’t smeary. I love how these episodes look. For something like Inferno to have such a 360 degree turn around in quality makes this DVD an essential purchase for me. 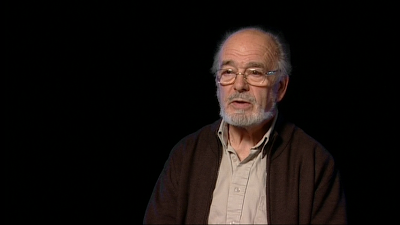 Audio Commentary: (from previous release) Nicholas Courtney, Barry Letts, and Terrance Dicks. John Leven pops in for a couple of episodes on his own. This commentary was recorded before getting a moderator on these commentaries. There isn’t anyone like Toby Hadoke on it and that is fine at least for this release. 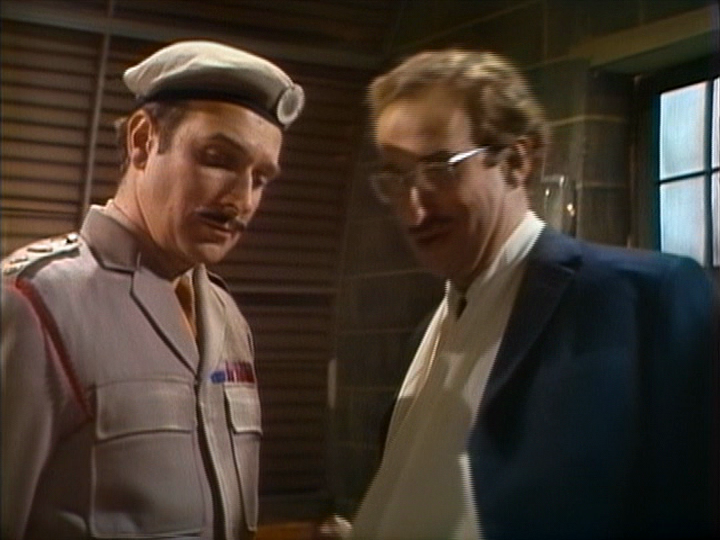 It very conversational and fun with Barry doing a great job leading the discussion and explaining some of the production issues facing the story when director Douglas Camfield got ill. John Levene is amusing especially when he talks about his approach to playing a Primord. Production Subtitles: newly written by Martin Wiggins and they are, as usual, amazing with all sorts of minutia. Incredible! Can You Hear The Earth Scream? This was on the original release and is a very good making of for the story. It is simply put together, nothing too incredibly fancy which is always a plus for me. I think, production wise, the simpler is the better way to go with making these. It goes into great detail as does the commentary about making this story with the health issues of Douglas Camfield. There may even be a story about eye-patches somewhere in here! Hadoke vs. HAVOC: This is a new feature and it is fun. 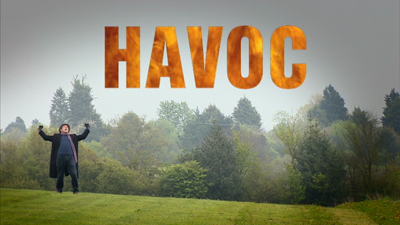 Toby Hadoke tracks down all the blokes from HAVOC. 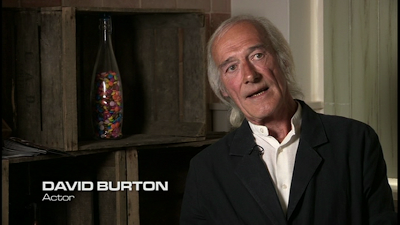 HAVOC is a group of men who did the stunts on Doctor Who during the Pertwee era. Have you ever seen in the credits Action by HAVOC? Derek Ware started this group. Toby spends a little bit of time which each member and then brings them all together to help him carry out a stunt. I feel bad as Roy Scammell who is 80 takes a nasty fall when playing some hockey in one of the segments. Are the black & blue marks on his arm from that! It is a very sweet piece and it was nice to see them all back together again. Doctor Forever! Lost in the Dark Dimension: new feature. I think more could be made about Lost in the Dark Dimension but there is a lot of information here about how this thirtieth anniversary story was almost a reality. Oddly, there is no Ayesha Antoine who had been hosting the other installments but was narrated by Zeb Soanes who did a fine job but Ayesha brings something different to the program. She is more than just another voice. 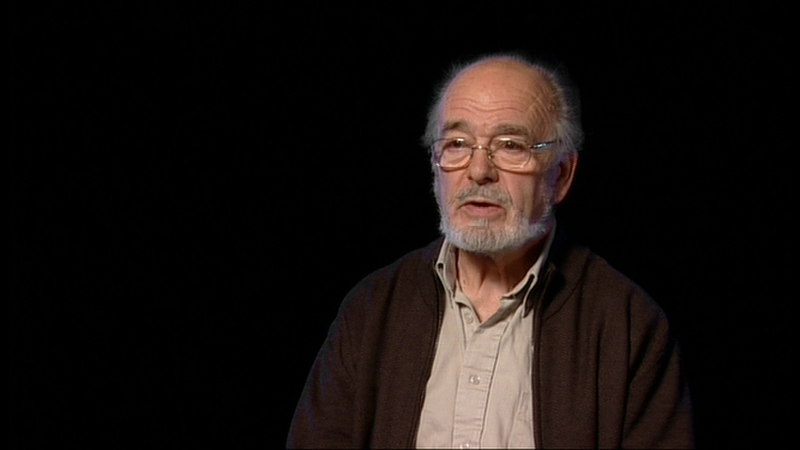 It is also interesting that Adrian Rigelsford notes the story’s cancellation had nothing to do with Philip Segal wanting to make his own Doctor Who which is at odds with what we heard in the documentary on the TV Movie DVD set called The Seven Year Hitch. Also, the mystery about David burton finally gets answered….well almost. The UNIT Family - Part One: On the original release. To be honest, I find these type of documentaries a little uninteresting. I know others really like it but I prefer story specific documentaries. Maybe I am not a huge fan of the idea of the UNIT family? I prefer more archival extras such as the next one. 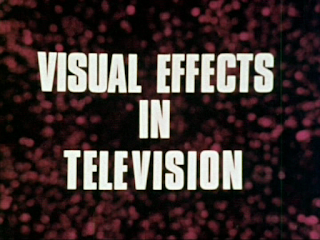 Visual Effects Promo Reel: On the original release. This was a short film to “sell” the expertise of the visual effects team. This stuff is amazing and a lot of fun to see. I have said time and time again that this stuff is priceless to me. Deleted Scene: On the previous release. 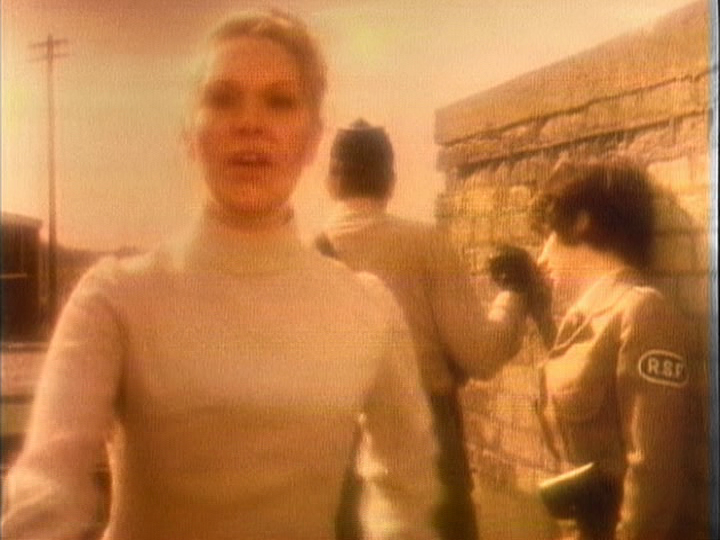 The scene that was kept on the US broadcast of Inferno from the 1970s was deleted from the broadcast version prior to transmission. To me, this has always been part of the story but was quite rightly excised for the DVD and kept as a deleted scene. 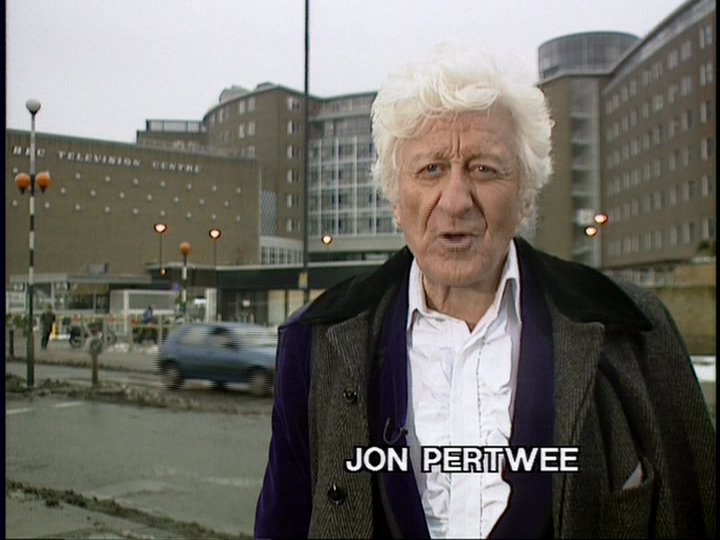 Pertwee Years Intro: On the previous release. Jon Pertwee introducing Episode 7 of this story on the VHS release The Pertwee Years. It nicely completes the package. A new photo gallery and PDFs round out everything. PDFs include Radio Times listings and 1971 Doctor Who Annual. Packaging: It comes in a standard double disc Amary case with a cover by Lee Binding. The new cover is much better than the original R1 cover but still isn’t quite right. I am a big fan of the R2 cover by Clayton Hickman. I do like the simplicity of the cover but small details annoy me such as the Brigade Leader on the cover is taken from two different photos. The head is out of proportion with the body. At least the spine of the story is spelled correctly unlike the spine for The Mind of Evil. Oops. Here are some comparative screen grabs between the 2006 R1 Release and this new set. Click on the image and arrow to the next one to see next frame. Here is a split screen between the original DVD (left) and 2013 restoration (right). Courtesy of Robert Franks. I have not felt let down by these Special Editions at all. I love the improved picture on the episodes and I enjoy the new features. This is one story I truly felt needed to be revisited and I was absolutely not disappointed. If you are on the fence about these Special Editions then I think this is a perfect one to start out with to see for yourself. Next week: It’s time for another 50WHO article. I look at one of the most incredible and improbable missing episode finds. 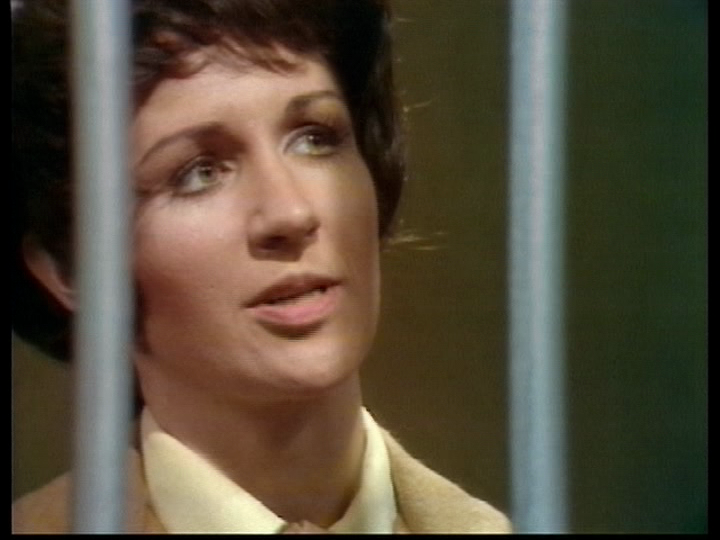 Many fans dreams came true when it was announced all of The Tomb of the Cybermen had been found. It was announced to the world in January of 1992. How did I know about it in November of 1991? The screengrabs are really like night and day - the new disc looks amazing! As pointed out on Roobarb's the grabs aren't exact (which I know) but I think the point still comes across at how much better the new restoration is over the old. i have this on dvd too and the restoration is amazing. Totally agree with you about Ian Fairbairn's turn as Bromley. Totally convincing as 'the possessed'. 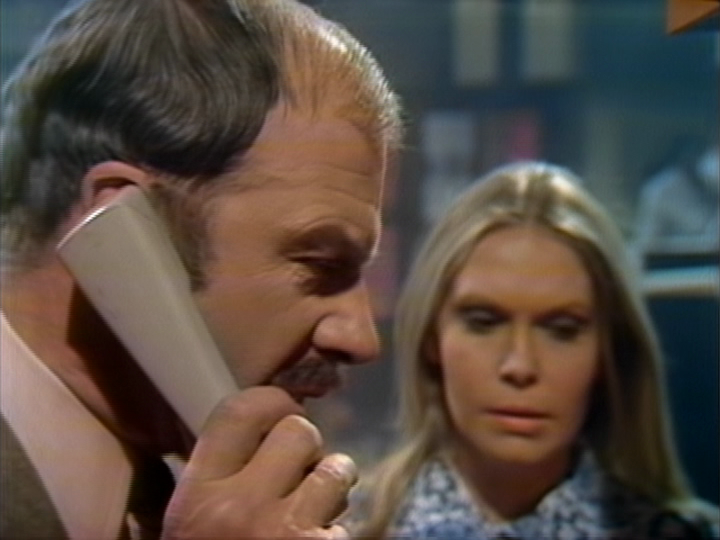 Also the stock music from this story also appeared in timeslip(1970/71) in time of the ice box and year of the burn up. This is one of my favorite stories of the whole series. I'm generally satisfied with my VHS collection, but now I've read this, I'm sold ( on this one, at least.) I've got to hear Levene's Primord story! It is pretty good and so are the contents of the discs. I don't think you will be disappointed. Thanks for visiting the site. Nice to hear from you.